On Monday, the Indian government announced an ex-spy would be appointed as the new interlocutor for Jammu and Kashmir. In a press conference in New Delhi, Home Minister Rajnath Singh stated that Dineshwar Sharma would speak to “all stakeholders” in a fresh attempt to end the nearly three-decade long insurgency in the state. Sharma, 63, retired as the director of the Intelligence Bureau (IB), India’s domestic spy agency, in December. During his long career, Sharma was appointed as the assistant director for Jammu and Kashmir in 1992. During his tenure, the militancy in the region was at its most fierce, and the IB was under pressure after insurgents had shot dead four officers from close range in the state capital, Srinagar. According to media reports, Sharma was the architect in the successful arrest of the Hizbul Mujahideen terrorist Ahsan Dar. In addition to Kashmir, Sharma is also the interlocutor for ongoing peace talks in the restive northeast of the country. Up to this point, the Indian government and the security forces have adopted a hardline stance against militancy in the Kashmir Valley. In security circles, there was a need to demonstrate to the Kashmiri populace that an insurgency could not survive against the full might of the state machinery. The point was made that no concessions could be gained by gunmen, either Pakistani or local insurgents. Counterinsurgency operations were picked up, militants and their hideouts were specifically targeted and destroyed, mass curfews were implemented and internet access in the valley was cut off. Yet however stringent the government response to militancy, the idea lingered on. 2017 has been the most violent year in the valley for decades, with daily instances of clashes between civilians, security forces, and militants. Dineshwar Sharma is just another in a long line of intermediaries who have tried to act as a political bridge between the government and separatist factions in Kashmir. The first real interlocutor for Jammu and Kashmir was former Union Defense Minister K.C Pant. His tenure under the Vajpayee government in 2001 soon collapsed as India and Pakistan came to the brink of war following the Parliament attacks in New Delhi in December of that year. Following this, in 2002 attempts began to restart the peace process with the appointment of a Track II committee on Kashmir. The committee included advocate Ram Jethmalani, along with senior journalists Dileep Padgaonkar, Jawed Laiq, and current Minister of State (MoS) for External Affairs M.J Akbar, along with other prominent members of civil society. This committee did not make any progress, and was soon after disbanded. The government tried again in 2003, when it appointed the former Home Secretary N.N. Vohra to the post of interlocutor. Vohra continued in this role until 2008, when he was made governor of Jammu and Kashmir, a post which he continues to occupy to this day. In this period, other players such as current Finance Minister Arun Jaitley and former Research and Analysis Wing (RAW) Director A.S Dulat tried and failed to make any headway with the crisis. Finally, in October 2010, the most recent trio of interlocutors was appointed by the Manmohan Singh government. This panel consisted of senior journalist Dileep Padgoankar, academic Radha Kumar, and former Information Commissioner M.M Ansari. The three spent a year in Jammu and Kashmir and met more than 700 delegations from all 22 districts in the state. In a report, which now sits gathering dust on Home Ministry shelves, the committee recommended that the army’s visibility in the valley be reduced, human rights violations be urgently addressed, and the controversial Armed Forces Special Powers Act be reviewed. All these suggestions were duly ignored by New Delhi. Most of the mediation attempts failed partly due to the lack of a political mandate. When the committees did work, and came out with reports, these were duly ignored by the decision makers in government. In many cases, the appointment of interlocutors appeared as simply measures to buy New Delhi some additional time, or a response to international pressure over stringent crackdowns in the valley. In the current case, however, Dineshwar Sharma appears to be going in with the full blessing of the government. It remains to be seen whether he can create an atmosphere of dialogue in a region that has become increasingly febrile over the past year. The task at hand will require a prodigious skill at balancing out opposing parties. For, if Sharma does create the conditions for talks, he will not only have to deal with separatist elements such as the Hurriyat Conference but also with the hawkish Bharatiya Janata Party (BJP) in the state. The BJP currently shares power in Jammu and Kashmir with the soft separatist People’s Democratic Party. The BJP vigorously opposes concessions of any sort to the separatists. Finally, Sharma will also have to deal with the evergreen issue of Pakistan. Despite what the BJP says, any lasting solution to the Kashmir problem will have to involve the separatists and Islamabad. 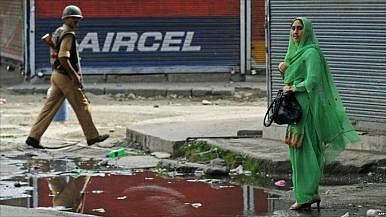 New Delhi for now refuses to countenance a diplomatic solution for Kashmir involving Pakistan. Is this another case of old wine, new bottle? Time as always will tell. Gautham Ashok is a freelance journalist who has written for The Diplomat, Dawn, and other publications.